Pension Pálava is located in a picturesque village near the reservoir in Nové Mlýny in location called Pálava This wine region is famous for its unique natural beauty and monuments under the protection of UNESCO. In the nearby village was found statue Věstonická Venuše, known throughout the world. 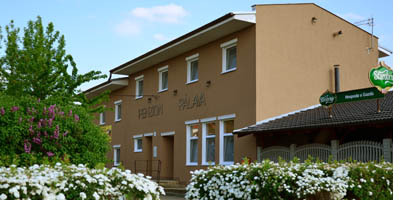 In our homely pension close to Nové Mlýny offer accommodation in two-bed rooms with extra bed, each of which is equipped with bathroom with bath. Each room has a TV and total capacity is 36 beds. You can also enjoy free wireless internet access Wi-Fi in rooms for both residents and throughout the area. The area also includes a restaurant that offers breakfast, lunch and dinner for all guests staying in the pension Pálava but also all the others who have decided to spend time in the beautiful countryside on Pálava. In summer there is ready for you covered outdoor seating area with barbecue, which gives the right atmosphere summer vacation.